Fellow members of The Revolution. Imagine a time in the future where the world really is a better place. The people of the world are free, well-fed and at peace. Our environment and fisheries are safe and healthy. Feels great doesn't it? Next imagine that in a couple of years you receive your favorite fly catalog in the mail. You run for your man-sanctuary, flip to page X and bask in the stench of the Carp Fly section. Bursting with innovative and constantly evolving patterns by Fly-Carpers for Fly-Carpers. By fate I have a unique chance to possibly participate in this important step forward. Roughly one week after I started Fly-Carpin and one day after I joined OBN the Montana Fly Company and Outdoor Blogger Network teamed up to announce a Fly Tying Designer Contest. Only the bloggers of the OBN are eligible and the winner will have his fly included in the MFC Catalog, receive royalties and become a paid fly designer. What a great opportunity for all involved. OBN made some member bloggers happy which truly seems to be important to them. MFC gets some sweet flies submitted and some great press. And who knows...remember that awesome catalog of the future? Maybe some of McTage's creations are included inside and the MFC logo is on the cover! Here are the flies I am submitting. 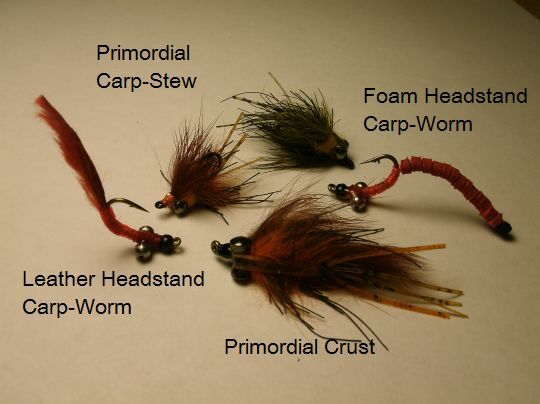 These flies were all designed specifically with Carp in mind. Naturally they will work for other species as well, but this is Fly-Carpin and Fly-Carpin is what we do. Good luck to my fellow bloggers, there are some nice flies being submitted for this competition. If people would like they can check out some of the other submissions by reading the comments at the OBN contest announcement page. There is also an opportunity for the greater revolution to participate. MFC has established a well maintained facebook page. Apparently some of the motivation for this contest was a desire to to improve traffic to their page and therefore achieve improved communications with customers. In other words they want your feedback, so If that catalog sounds good to you drop by and tell them. Let them know you are a member of The Revolution and The Revolution wants Carp Flies! Maybe not McTage's particular brand of stench, but stench none the less. You have some great carp flies there, McTage. Good luck in the contest. Check out Ty's blog Finewater. Its a good one with allot of species variety. I particularly like the excellent report below (I am biased) and what he has written about gar. Great looking patterns, good luck and they look pretty deadly to me! Thanks for the heads-up Rebecca. Pretty darn exciting to have actually won!